Like this site? Tell it to the world! Almost thirty years’ experience behind them and yet Sweet William doesn’t cease to surprise us with its music. Once again, the Germans go far beyond the scene’s clichés and stereotypes with the release of “Ocean”. The new album is a conceptual work that goes in depth with its title’s metaphor for life. Music and lyrics focus on the existential distress of the human being, but also on its hopes and desires. As a consequence, the eighteen tracks featured here (which really fly by) encompass unsettling atmospheres and beauty reveries in near equal measure. Some times these soundscapes are provided by classic Goth Rock numbers whereas in other occasions they come to us through melancholic Cold Wave pieces or experimental electro/psychedelic passages. In fact, all the virtues that have made unique this band over the years are present here, even though modernly enhanced and showing a maturity degree to which one only can take off the hat. So, it might be argued that Sweet William proposes an open-minded back to its roots in this new episode, what also makes even more sense due to the return of the band’s original drummer Marius Nagel. 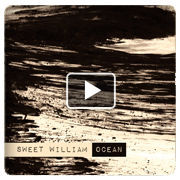 Sweet William’s frontman and founder, Oliver Heuer (vocals, guitars, synths, programming), Frank Breuer (bass, programming) and Markus Gerlach (drums, percussion) complete the current line-up.